Have you always wanted to go on a jungle safari? Try it in your own backyard! 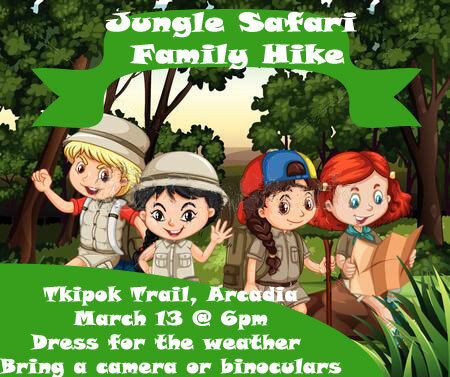 Bring along a camera or binoculars and join us on the Tkipok Trail in Arcadia (meet at the old Arcadia School parking area) Hike starts at 6pm and will last approximately an hour. (with the time change it will stay light out 🙂 ) Dress for the weather and prepare to be stealthy! The Tkipok Trail is an easy grade trail but has some stairs to climb at one location.